National Aviation Hall of Fame enshrinee and former world aerobatic champion Sean Tucker goes to a knife-edge less than 20 feet from the ground. 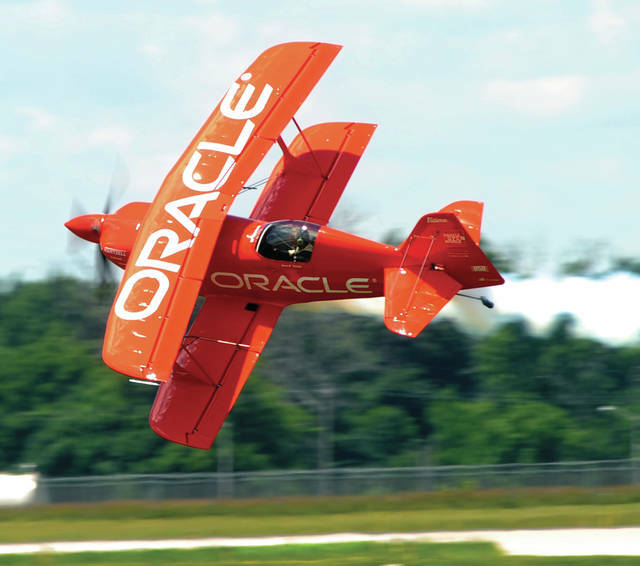 Tucker will return to the 2019 Vectren Dayton Air Show as part of Team Oracle. DAYTON — Vectren Dayton Air Show officials announced last week that the new Team Oracle with Sean D. Tucker and Johnny De Gennaro will debut at Dayton in 2019. In addition, Dayton has been selected for a U.S. Army Golden Knights demonstration in 2019. This year’s Vectren Dayton Air Show Presented by Kroger will take off June 22-23 at the Dayton International Airport headlined by the U.S. Air Force Thunderbirds. 2019 marks the 45th year for the popular summer event in the Miami Valley region. “What a great show lineup we have for 2019,” stated Scott Buchanan, Chairman of the USATS Board of Trustees. “The new Team Oracle, our Army’s amazing Golden Knights and the awesome Thunderbirds, along with other top attractions previously announced, will make 2019 a show you’ve got to see,” he added. Fasten your seat belts as the new Team Oracle led by air show legend Sean D. Tucker flying the Oracle Challenger III and John De Gennaro, also known as “Johnny D,” in the Oracle Extra 300L, take you to the limits of your imagination with aerial precision and elegance. Then, be prepared for jaw-dropping thrills as they separately catapult, tumble and hurdle across the sky for a performance unlike any ever seen before. Sean and his Oracle Challenger III have thrilled millions of fans for years. Don’t miss this opportunity to experience the new Oracle Team starring Sean and Johnny D. for the first time. Also, witness Sean flying his amazing Challenger III aircraft for the last time. This infamous Challenger will be heading to the Smithsonian’s National Air and Space Museum “Thomas W. Haas We All Fly” gallery in 2021. Formed in 1959, the Army Golden Knights inspire audiences of all ages with their patriotism and exciting maneuvers. The Golden Knights are the Army’s official demonstration team. Members are drawn from U.S. Army paratroopers who have demonstrated excellence in parachuting skills. They will thrill spectators with their intricate canopy work along with skydiving formations and landings that require extreme precision. Based in Ft. Bragg, North Carolina, the Golden Knights represent the skill and professionalism of U.S. soldiers serving all over the world. The 12-member team will travel to Dayton in their Fokker C-31A Troopship which will also serve as their jump aircraft. The team last appeared in Dayton in 2018. Tickets to the show are on sale at daytonairshow.com or can be purchased at Kroger stores beginning May 13.